The Great Kererū Count takes flight today with everyone in New Zealand being invited to be citizen scientists for the next 10 days and count kererū. The aim is to build up a comprehensive picture of where our native pigeon is – and isn’t – found. The annual count runs from today, Friday 21 Sept until Sunday 30 Sept.
Kererū are our only native bird that wears the iconic New Zealand 70’s white singlet which makes them easy to spot perched in treetops or on power lines. They not only live deep in our forests but have also adapted well to urban living. The main threat to kererū is predation by introduced mammalian predators, particularly feral cats, possums, stoats and rats. These threats are even more serious for kererū during nesting season, as unlike many of our other native birds, kererū only lay one egg per nest. 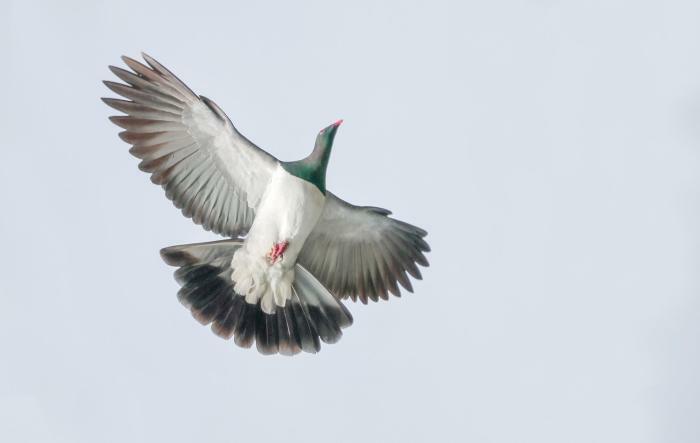 Other threats include collisions with man-made objects such as fast-moving vehicles, overhead power and telephone wires, fences and windows, and most alarmingly, illegal hunting of kererū.